Haifa, Israel – Hizballah's continuing alliance with embattled Syrian President Bashar al-Assad has the notorious Shia political and military movement navigating choppier waters than at any other time in recent memory. President Obama – angry at Hizballah's continued support of the Assad regime – didn't mince his words in Jerusalem March 21: "Every country that values justice should call Hizballah what it truly is – a terrorist organization." That's a much more direct statement than administration officials previously were willing to make. In 2010, then-National Security Advisor and current CIA Director John Brennan spoke of trying "to build up the more moderate elements" of the organization. It's a fast fall from Hizballah's previous high-point of influence, Mordechai Kedar, an Israeli scholar of Arabic specializing in Islamic movements and ideology, told the Investigative Project on Terrorism. "Hizballah was the most popular organisation in the Arab world after the 2006 Lebanon War [against Israel], but now their image is as bad as it could be because Hizballah is considered as a collaborator with the most vicious of regimes [Syria]. They have lost much of the image they gained after the 2006 war." "From the outside point of view, they [Hizballah] are supporting Assad by sending hundreds of combatants to Syria in order to preserve the regime, because they know that if they are not loyal to their friend, no-one will be their friend in the future," Kedar explained. "Secondly, they need the Syrian regime as the bridge between Iran and Lebanon. It would be very hard for them to function without Syrian mediation between Lebanon and Iran when it comes to supplies, logistics, missiles and all the weapons that they need." Shia leader Mohammed Ali al-Husseini accuses Nasrallah of "dragging Lebanon into the abyss and that the Shiites in Lebanon, and Lebanon itself, will pay a high price for this behavior," Kedar said. "But also from inside Hizballah there are voices today – not out loud, but behind the scenes – which claim that gambling on the Syrian horse is gambling on the wrong horse, and Hizballah will be associated forever with Assad's regime, especially its last brutal stages of life. This will hurt Hizballah and could even persuade Europe to place them on its list of terror organizations." Iran's support makes Nasrallah "immune, because not only does he have their political support, he has the money and the control over the resources of Hizballah, and most importantly of all, the backing of Ayatollah Khamenei [Iran's Supreme Leader]." Al-Husseini is the leader of the Arabic Islamic Congress (AIC) and one of a growing number of high-profile Lebanese Shia who believe that Hizballah is wrong for their community and wrong for Lebanon. The U.S. has allegedly reached out to al-Husseini as a potential partner in undermining Hizballah. Al Husseini's reputation has suffered a number of setbacks however, including being tried and later acquitted of being an Israeli spy, while U.S diplomatic cables leaked by Wikileaks in December 2011 cast doubt on just how genuine his rift with Hizballah really is. "AIC headquarters are located on the Beirut airport highway, a Hizballah-dominated area," the cable noted. "Contacts in the Beirut southern suburbs observed that Hizballah has neither harassed nor interfered with AIC." The long-standing Amal movement (another allegedly courted by the U.S.), is also seen as a more moderate Shia force and gained 13 seats to Hizballah's 12 in the 2009 Lebanese general election. But Amal, led by Nabih Berri, has endured years of in-fighting while claims of nepotism and corruption have so far negated its political effectiveness. Despite opportunities to increase their influence amongst the Shia population those groups opposed to Hizballah have failed so far to make any real impression in gaining ground on the "Party of God." 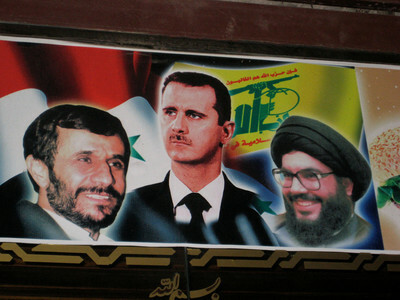 If Hizballah's influence wanes it will be due to blindly supporting Assad in Syria, its reduced ability to function and provide the social support to its community that has come through its financial alliance with Syria and Iran, and possibly because of the emergence of a new political Shia force in South Lebanon. On March 20 Israel's Ynet.com reported that "a new political movement is gathering followers right in the Hizballah stronghold of Beirut's southern suburb... Hizballah and its leader Hassan Nasrallah, once the undisputed stars of the Arab world, are rattled by surprise opposition from within their own ranks." The recently formed Movement for the Lebanese Citizen (MLC) is led by Imad Kamiche, a former Hizballah "operative." Ynet.com – the online version of Israel's highly regarded daily newspaper Yediot Ahronot – suggests MLC is "attempting to present an alternative to the rigidly Shiite framework represented by Hezbollah and Amal, and place the Lebanese citizen at the forefront, regardless of ethnicity." Hizballah suddenly appears keen to portray itself as tolerant of dissenting voices. "The fact that opposition elements are still residing in Beirut's southern suburb is a testimony to the group's tolerance," a spokesman said. The article cited sources who added that "Hizballah actually wishes to absorb the opposition and their criticism, even contacting them for that purpose." MLC founder Kamiche, however, hinted that he had been given clear "advice" to stay out of the political arena, a thinly veiled hint that Hizballah will only tolerate his opposing voice to a certain point. This is supposed to be an election year in Lebanon. Sheikh Nasrallah and the Hizballah leadership will surely be aware that their intervention in the Syrian Civil War could cause a backlash at the ballot box and significantly reduce their share of the vote. Matt Levitt, director of The Washington Institute's Stein Program on Counterterrorism and Intelligence, suggested recently that Hizballah still has to nail its colors to the Iranian mast to the exclusion of almost all other political and military considerations. "What we see now is that Hezbollah is going to do things today that are in Iran's interest even if they expressly run counter to the interests of Lebanon and Hezbollah's own interest there," Levitt argued. "People tend to misunderstand the relationship between Hezbollah and Iran, which has changed over time but is now extremely close. The U.S. intelligence community has publicly described this as a 'strategic partnership.' But people don't fully appreciate Hezbollah's ideological commitment to the concept of 'velayat-e faqih,' or guardianship of the jurists, which holds that a Shiite Islamic cleric should also serve as supreme head of government. For Hezbollah, this means the Iranian leadership is also their leader – not for every foot soldier, but for Hezbollah's senior leaders, absolutely." Hizballah's reputation had already been seriously damaged in the eyes of many EU states by its role in Syria, but the EU has thus far proved reluctant to officially designate it a terrorist organization. The recent confirmation by the Bulgarian government investigation that Hizballah was responsible for the bombing of a bus of Israeli tourists at Burgas last year was another blow to the Shia force's credibility and may finally persuade the EU to act. The EU's argument that such a designation might destabilize the fragile Lebanese political status quo was left null and void on Friday evening when the government of Prime Minister Najib Mikati – which included Hizballah – resigned, citing irreconcilable positions between the various factions over scheduling elections. Mikati's spokesman, Fares Gemayyel, simply said, "The prime minister cannot work in such conditions. He needs to respect the constitution." A day earlier in Cyprus came the first conviction of a Hizballah member by an EU state as a court in Limassol found Hossam Taleb Yaacoub guilty of "being a member of a criminal organization." Because the EU has not yet designated Hizballah a terror organization, the original charges of "being a member of a terrorist organisation" had to be amended to obtain a successful conviction under current Cypriot and EU law. Yaacoub was found guilty on five out of eight charges before the court. "The United States applauds the government of Cyprus for its professional investigation and successful conviction in court today of Hezbollah operative Hossam Taleb Yaacoub on a range of charges involving his surveillance activities of Israeli tourist targets," said State Department spokeswoman Victoria Nuland. "Today's verdict underscores the need for our European allies – and other governments around the world – to crack down on this deadly group and to send a strong message that Hezbollah can no longer operate with impunity, at home or abroad." "The 'Party of God' has turned its 'weapons of resistance' not on Israel, but on fellow Muslims. This, more so than the UN indictment of four of its members for the murder of former Prime Minister Rafiq Hariri, and more so than the exposure of Hizballah operations in places like Azerbaijan, Cyprus, Bulgaria, Thailand, and Turkey, is what now threatens Hizballah's standing as a Lebanese political party and social movement."